To be allowed to drive a car, you need to pass both theoretical and practical tests so that you don’t become a danger to yourself and others. For all except the most rudimentary jobs, certain qualifications are required, and for the more complex jobs, years of training. Yet for one of the most challenging and vitally important occupations — parenting — no training or qualifications are required. “Parenthood remains the greatest single preserve of the amateur,” wrote author Alvin Toffler. This lack of knowledge or education is one of the reasons (although not the main one, as we shall see) why so many parents struggle. Those parents don’t necessarily fail to meet the child’s physical and material needs. They may in fact love their child and want what is best for them. Yet they are clueless as to how to deal with the challenges their child presents them with on an almost daily basis, nor do they know how to respond appropriately to the growing child’s emotional, psychological, and spiritual needs. Whereas in past ages parenting was excessively authoritarian, in our contemporary society many parents fail to provide the clear guidance the child desperately needs and longs for. There is often a complete lack of structure in the home environment, which resembles a rudderless ship that has been abandoned by the captain, adrift in the ocean. The parents don’t realize that the child needs them to be, as Susan Stiffelman so aptly calls it, “the Captain of the ship,” a term that by no means implies reverting back to the authoritarian mode of education of past ages. Rather, it is about finding a balance, a middle way, between having an excess of structure and no structure at all. Ultimately, though, the deeper cause of family dysfunction is not the parents’ lack of knowledge or education but their lack of awareness. Without a conscious parent there can be no conscious parenting! A conscious parent is able to maintain a certain level of awareness in their daily life, even though for most people lapses are bound to happen from time to time. When there is no awareness (other names for it are mindfulness or presence), you relate to your child, as well as to everybody else, through the conditioning of your mind. You are in the grip of mental/emotional reactive patterns, beliefs, and unconscious assumptions that you absorbed from your parents and the surrounding culture you grew up in. Many of these patterns go back countless generations into the distant past. However, when there is awareness — or presence, as I prefer to call it — you become aware of your own mental, emotional, and behavior patterns. You begin to have a choice about how to respond to your children, rather than acting blindly out of old patterns. Also, most important, you no longer pass those patterns on to your children. Without presence, you are only able to connect with the child through the thinking mind and emotions, rather than on the deeper level of Being. Even if you do all the right things, the most important ingredient in your relationship with your child will be missing: the Being dimension, which is the spiritual realm. This means the deeper connection just isn’t there. Intuitively, the child will sense that something vitally important in his or her relationship with you is missing, that you are never fully present, never fully there, always in your mind. Unconsciously, the child will then assume or rather feel that you are withholding something important. This frequently gives rise to unconscious anger or resentment in the child, which may manifest in various ways or remain latent until adolescent. Although this alienation between parent and child is still the norm, a change is happening. An increasing number of parents are becoming conscious, able to transcend the conditioned patterns of their mind and connect with their child on the deeper level of Being. So the reason for dysfunctional or unconscious parenting are twofold. On the one hand, there is the lack of knowledge or education concerning child rearing that strikes the sane balance between the old, excessively authoritarian approach and the contemporary, equally unbalanced one. On the other hand, and at a more fundamental level, there is the lack of presence or conscious awareness on the part of the parents. Whereas numerous books provide helpful “know-how” for those parents who read books, not many books as yet address the lack of awareness of the parents or offer guidance on how to use the everyday challenges of parenting as a way of growing in consciousness. Susan Stiffelman’s book helps the reader on both levels, which we could call Doing and Being. She imparts insightful knowledge and practical advice on Doing (or Right Action, as the Buddhists call it), without neglecting the more fundamental level of Being. 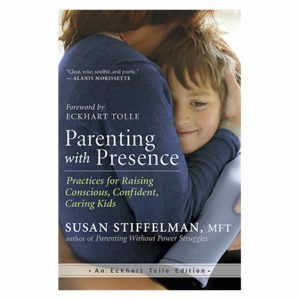 Parenting with Presence shows parents how they can transform parenting into a spiritual practice. It helps turn the ways your children challenge you into a mirror that allows you to become aware of your own hitherto unconscious patterns. And by becoming aware of them, you can begin to transcend them. Author Peter De Vries wrote: “Who of us is mature enough for offspring before the offspring themselves arrive? The value of marriage is not that adults produce children but that children produce adults.” Whether we are married or single parents, children will certainly help us grow into more mature human beings. Yes, children produce adults, but, more important, Susan Stiffelman’s unique book shows you how children can produce conscious adults.